ON THIS DATE (September 6, 1912) ... Walter Johnson, essaying to break the winning streak of the Kansas wonder, Joe Wood, failed in the attempt, the lad from the Southwest scoring his 14th consecutive victory for the Red Sox, and the Speed Boys winning their third game in succession against the ambitious Senators from Washington, 1 to 0. A pitchers’ battle was predicted between the gladiators of the mound, and a pitchers’ battle it surely was. Witnessed by 29,000 fans, the contest waxed hot every moment, two two-base hits driven out by Tris Speaker and Duffy Lewis in Boston’s sixth battle session, after two hands were out, producing the only run that crossed the plate all afternoon. It was no fluke win, but just the delivered of the necessary punch to keep their splendid headway in the American League race, that returned Jake Stahl’s warriors the winners. 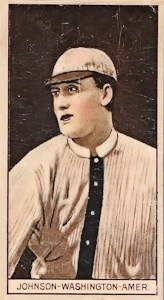 All day it was hard, clean, crisp baseball; steady, rather than of the hair-raising kind, and a battle that it was all glory for Joe Wood to win, yet one that Johnson could lose without a tinge of dissatisfaction over his own great pitching. Some will say that 30,000 yes, even 35,000 persons, pushed their way past the ever-creaking turnstiles at Fenway Park yesterday to witness the battle between the American League pitching giants. But there were fewer than 30,000 -- something more than 29,000. But 29,000 was some crowd -- a wonderful crowd. It packed the stands and the bleachers, and trooped all over the outfield inside the stand and bleacher boundaries. 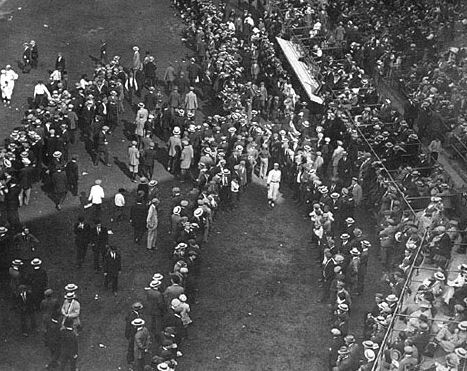 In the grandstand the broad promenade was packed solid ten rows deep with fans on tip-toes to see what was going on. The playing field was surrounded completely by a triple, even quadruple, rank of humanity, at least 3,000 assembling on the banking in left field, and the mass of enthusiasts extending around in front of the huge concrete stand. So thickly were the spectators massed, and so impossible was it for the squadron of police to keep them back, that the players’ pits were abandoned, the contestants bringing their war clubs out almost to the base lines, and not seeing the conflating walls of their dugouts from one of the battle to the other. It was an orderly crowd, though, and one that did not interfere with the playing of the game. Only one or two hits went into the recesses of left field, and that these were held down as two-baggers neither proved a handicap or an asset to the players who drove out the long hits. It was remarkable that no one was hurt, so approximately were many hundred to the scene of play. 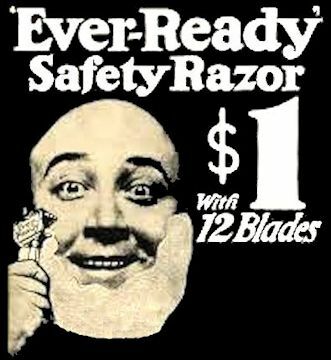 One little boy was hit by a foul tip, and tenderly carried to the players’ room; but he soon insisted that he was “all right” and in a little while he was back in his place again, lending all the strength of his tender lungs to the glory of the Red Sox victory. Of course what brought that vast concourse was the promised set-to between Wood and Johnson. 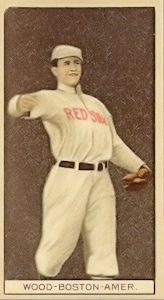 Johnson, it was said, was most anxious to show his prowess against Boston’s favorite, while it was intimated that Wood rather favored allowing some other Boston pitcher to meet Johnson, so that he might pitch against Groom, against whom Boston might have a better opportunity to win, and Wood securing, therefore, a more favorable chance to increase his record of straight victories. However this may have been, and whatever transpired so that Wood and Johnson came together yesterday, their meeting proved the classic of all baseball here, and behind the two great pitchers the other 16 ball players contributed as sterling a game as possibly could be played. Both pitchers seemed to have their best at their command. Both had speed, control and, withal, a fighting spirit that spread itself over the entire battlefield. Neither team made even a semblance of an error, a little short passed ball contributed by catcher Cady of Boston being the only slipup of the day. Boston won the game, but the question of whether Wood or Johnson is the greatest pitcher still remains unsolved. At least, yesterday’s game gave no assurance that either should acknowledge the superior prowess of the other. Washington made six hits, including two doubles against Wood, while Boston hit Johnson’s speed safely only five times, two of these hits, however, being combined for the run that meant so much when the hour of final reckoning was at hand. Wood issued three bases on balls, while Johnson passed only one Boston batter to first base, but on the other hand no less than nine husky Senators fell strike-out victims to Wood’s delivery, while only five Red Sox batters walked to the plate only to return with eyes downcast because they had been struck out. The six hits made by the Senators were scattered through as many innings, and so, of course, in no one session was there any combination. On the other hand, Boston got to Johnson in only three of its eight batting innings, bunching two singles in the second, after having made one stray hit in the first, and then, save for the two doubles that brought home the winning run, going hitless for the remainder of the game. The big run that came in the sixth was hammered across the home plate after two men were out. Harry Hooper started the inning by flying out to Moeller and then McBride made a play to first on Steve Yerkes. Tris Speaker, who has had a habit this year of declaring himself “in” on most of Boston’s fireworks, appeared to be easy for Johnson when he came in to bat, following Yerkes. Johnson got Tris to go after a ball close to him, and then bent the ball over the outside corner for another strike before Speaker was aware what had happened. It was on the next ball, though, that Johnson’s trouble started. He gave Speaker a good one, and “Spoke” made one of his characteristic punches, lacing the ball like a bullet past third baseman Foster, and landing at second base before Moran scooped up the ball on the edge of the crowd in left field. Lewis was next, and Johnson began to put on speed. The Washington outfield moved well over to the left, facing the plate, playing for Lewis, as he usually hits. But Duffy “crossed” every one. He swung hard at one of Johnson’s speediest balls, which came over like a flash. Lewis had the gage all right, but he could not get his bat around far enough to hit to his accustomed field. Instead, the ball shot off to right field, and with not much fire on it. The ball sped away over Gandil’s head, and then began to drop toward the foul line. Moeller, who had been almost over in center field, was off with the crack of the bat. The ball was almost black, and many in the crowd could not see it, but they did see Moeller legging it toward the foul line for all he was worth. Faster and faster he came, and nearer and nearer the ball came to earth. Finally, with one frantic plunge, Moeller dove after the ball. For an instant it seemed that he had caught it, but the ball just touched his finger tips and dropped onto the sod. Speaker was almost across the plate when Moeller got to the ball, for there were two out and “Spoke” had started the instant the ball was hit. Lewis also was legging it around, and was at second base when Moeller picked up the ball and shot it back to Laporte. But the run was in, and there could have been no one on the field who did not realize that the game was won. Boston did not do much except in the sixth inning. In fact seven members of the home team were all who reached first base all afternoon, and of these only four reached second base. In the first inning Yerkes singled, but was forced by Speaker, who was thrown out trying to steal, and in the second when Gardner and Engle grouped their singles, they remained standing on second and first bases while the subsequent batters went out on fly balls. In the fourth Speaker received the only base on balls issued by Johnson, and advanced on Lewis’ sacrifice hit; but Gardner and Engle grounded out. Washington had many more chances than Boston had to get into the going, but Wood held the lid down to tight. In the very first inning Milan opened with a hit, but immediately fell victim to a double play when Foster hit straight at Wood. In the third, which McBride opened with a double and was advanced by sacrifice, Wood again stopped proceedings by smothering a slash from Johnson and nipping McBride between third base and home. Wood then filled up the bases by passing both Milan and Foster, then whipping the ball over against Moeller and striking him out. A hit and a pass put two Senators on base in the fifth when there was one out, but neither Milan nor Foster could bring across the much-desired run, and while in the last four innings three Senators saw second base, that was the farthest point to which they were advanced. In the seventh Laporte doubled to right center just before Moran fanned for the third out, and in the eighth Foster singled and stole second, again with one man down, but only to want while his teammates popped up easily taken outfield flies. And then in the ninth, when one run would tie the game, Laporte’s opening hit and Moran’s sacrifice helped not at all, as Wood finished out his string by fanning both McBride and Ainsmith.